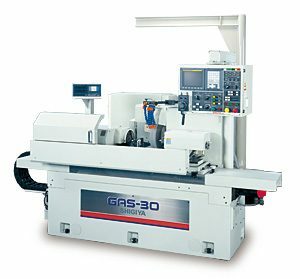 Featuring a large-diameter wheel spindle and rigid tailstock design, the GAS-30 production type CNC angular cylindrical grinder is suitable for an array of applications, including long, multi-steps and profile cylindrical grinding, among others. The highly stable spindle rotation achieves heavy-duty precision grinding. Being able to perform O.D. and shoulder face grinding at the same time improves efficiency.